Time was called on the game-making leg of the fifth annual TOJam hours ago. Afterwards, we had pizza and Eskil Steenberg was kind enough to give a presentation. Jammers were showing off their games and have done some tremendous work, especially considering the time constraint. Several people cut out early on the after party to get on the road and get some well-deserved rest. 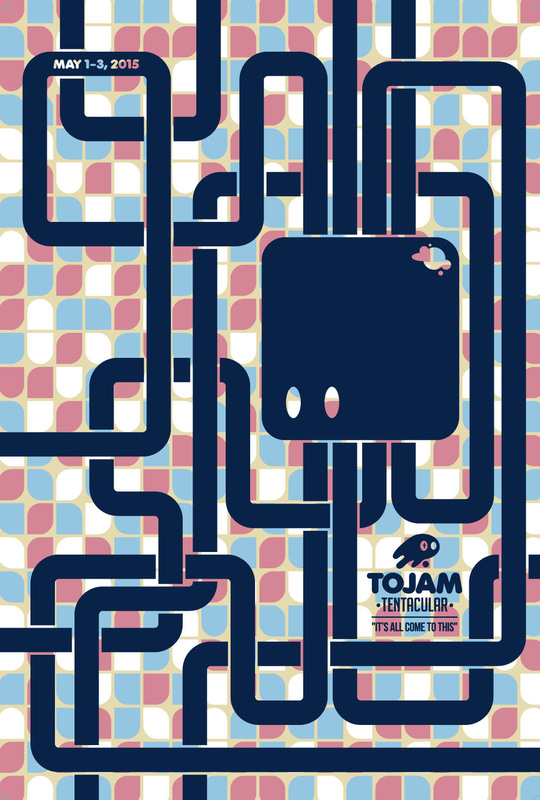 Stay tuned to the blog and the official Twitter feed in the next few weeks for information about the TOJam arcade, tentatively scheduled for late May, where the games will be showcased; along with some wrap-up information, thank-yous and shout-outs from this year's jam. To Jim McGinley; I hope not telling me to stay away this year worked out as you hoped. 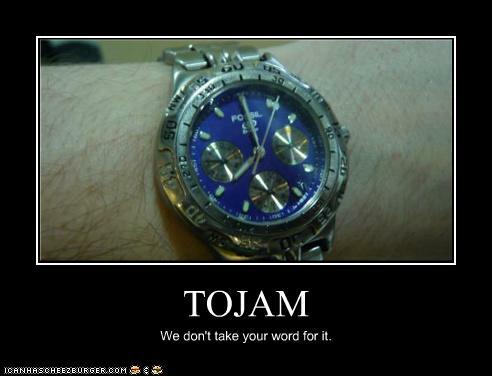 The best of TOJam Twitter will be posted in the next few days as promised. To Em; Thank you for being a great organizer and go-to person. I love your camera. To Robert; Thanks for humouring me while I was lording over the fruit trays. I never did ask you: Are you pro- or anti-melon? To Em's cousin, whose name I cannot dig up, but gave me directions to the closest Tim Horton's; I never got the chance to tell you: That was the best maple dip in recent memory. To everyone who attended the fifth annual TOJam: It was a pleasure to sit alongside you for three days and be involved in the game-making process. I hope to see you again at the arcade in late May, and at the next jam. Please help yourselves to whatever moves you tonight, even if it is just a much-needed face plant in a familiar pillow. To those who came by foot, by car, by TTC, by GO, by VIA rail, by plane and other methods not mentioned: Safe home. Time was called, we had out pizza and did some speeches, presentations and a raffle. The teams demoed some fabulous work, and several staggered out of here to get some sleep. I'll post more later, as right now we're packing up and moving the original equipment back in to the room. In another twenty minutes the coding deadline will pass for the jammers, and on the other side is pizza. I think this is actually kind of exciting, but then again I'm not trying to figure out why my sprite is indifferent to keyboard input or why my goat on a pole won't do whatever it is goats on a pole are supposed to do enough to appease the TOJam organisers. 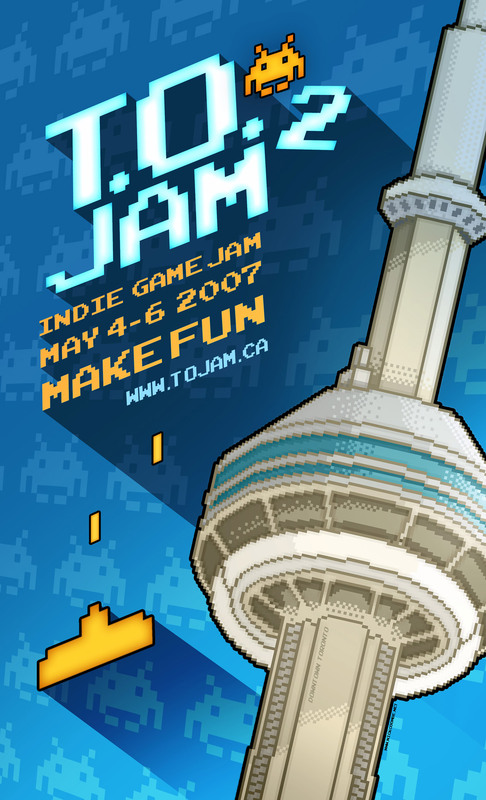 Eskil Steenberg is in town for FITC and decided to drop by TOJam, which is fast becoming the place to be seen and code in the GTA. Jim McGinley approached me just after I arrived and and asked me to take him to lunch (Em's only instructions were "don't come back tanked"). Three hours ago I was vaguely aware of who Eskil Steenberg is and that his one-man MMO-like endeavour LOVE is an independent and critical darling; I also have a new game to look into. LOVE is a procedurally-generated MMO played from a first-person perspective where players collect wealth for the benefit of other allied players. The art style of the game is remarkable, and so is the fact that Eskil built all of the associated tools and networking for the title himself. Over quesadillas, he told me that all of the technology he created was built for use with all future projects and not just specifically for LOVE. Part of his inspiration comes from Moore's Law and the idea that if computing power does indeed double every eighteen months game development must become twice as efficient every eighteen months in order to be sustainable (affectionately known as "Eskil's Law"). Eventually the conversation moved into the game industry's modern-day emphasis on presentation over gameplay mechanics. Eskil is interested in developing his technology to the point that it will enable users to tell their own stories in the context of gameplay; and that if he can get that and several other projects done and working the way he wants, he might be able to hire some people in future. I said that he should keep me in mind (this is what is known in the trade as "artless networking") and he told me he was anti-designer, so I said I also do quality assurance. Eskil agrees that I need to get some sleep. Because of a power test the college was conducting, Internet access to TOJam's location was down for several hours this morning, and those of us using the wireless network have resorted to the "swipe a live cable" method of connection to stay up and running We also fixed the incredible disappearing blog page (sincerest apologies, as I swear it was working before I packed up to come down here) but all is well again due to the backup. Not directly affecting TOJam was the out-of-commission Yonge subway line (the city's main artery). The mood here is surprisingly relaxed considering the deadline is in just over five hours. Jammers are upbeat, work is going well, someone already told me he was finished before qualifying it, and some really great concepts are being executed. 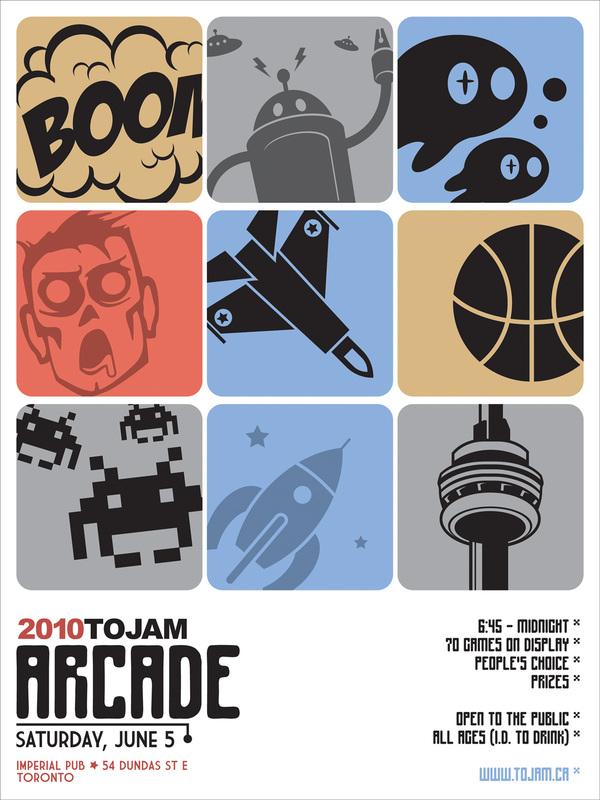 Clear space on your calendars now for the TOJam arcade. This is one you won't want to miss. Tonight's dinner was a nice Chinese spread provided by George Brown College, Tall Tree Games, and Carlos and Ginny of Good View Restaurant. I was trying to wrap my head around the concept of take-out for one hundred and sixty people, but dinner was an efficient buffet-style setup. After working the fruit trays, I have discovered that melon is the starch of fruits. I was pushing melon on anyone who got within reach of my tongs and by the time I got my plate I still had a disproportionate amount of honeydew left over. This evening has been hard crunch for the dev teams, but the results are impressive. Quite a few people have been bringing in all sorts of sleeping bags and bed rolls expecting to stay all night in an effort to get finished on time. I'm going to go thank my bed and shower for being there for me. 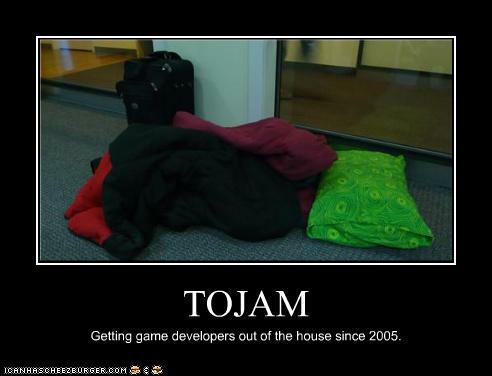 Em, one of the co-founders, said that Saturday is usually the quietest day of TOJam because this is the day of buckling down and making progress. Today has been a lot more quiet than yesterday, probably because the mass troubleshooting madness is over and done with and several catastrophes ended up not going off as planned. I'm looking at you, Angry Network Troll. Scheduled for tonight: Chinese take-out for one hundred and sixty people, which on the face of it sounds like a logistical nightmare, but I am surrounded by programmers. This can't be any worse than trying to get two people to agree on toppings for a single pizza, or the food they serve at Ludum Dare. Almost everyone is a bit bleary-eyed from sleeping on the floor or the excitement for those of us lucky enough to have a bed to go back to. Comparing notes with several attendees it seems that 4 a.m. was the magic hour for actually getting some rest. Things are definitely taking shape for the teams today. Programming is proceeding apace, rough art is moving and people are happy to demo what they've completed so far. TOJam number five is off to a roaring start. The teams are in and mostly settled, although the new day will bring new issues for some. The Angry Network Troll is still at bay; we tasted of the cheesecake tarts and Red Bull; we've already laughed, done the sublime and the ridiculous and got off on the right foot even if it snagged a few cables. Some have traveled here from out of the province and out of the country. Goodnight, jammers. May you crash safely if at all. For those who decide not to; do it while you can, and feel good about it. Come Sunday night some of us are going to be absolute wrecks, and it will be a blast. The starting address was delayed by about half an hour, probably because of the 7 p.m. after-work and commuter-crowd population explosion, although most of the early problems had already been worked out. The Angry Network Troll has not made a reappearance; which is almost too bad as he would have liked the cheesecake tarts. We all gathered in the second floor vestibule and were introduced to a lot of people most of us couldn't see but clapped for anyway. 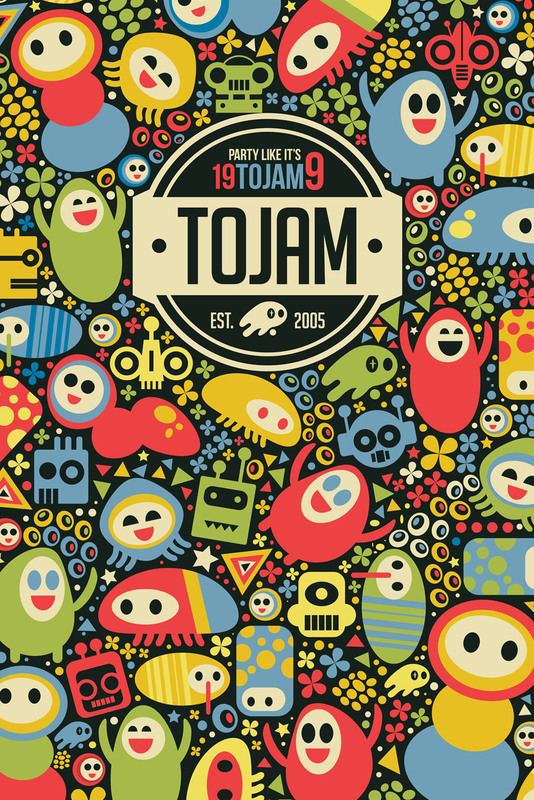 This fifth TOJam is the largest ever in terms of participants, and also raises the bar for the most corporate sponsorship and personal support. 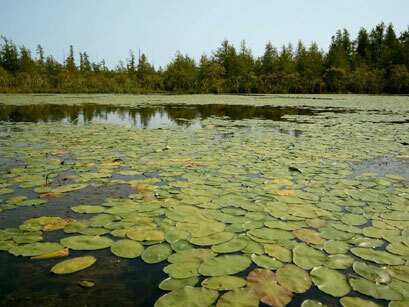 Also new and/or of much better quality; furniture, Internet access, and washroom facilities. At the end of the speech, one of the Unity guys brushed one of the Game Maker guys on the way back through the door, and said a gruff but not unkind "sorry." Truly, this is an amazing time we live in. Several teams are out, some have decided to use the kitchenette, and others are dining chez vending machine with attendant prices. Several fine chains that have not sponsored TOJam are within walking distance, and a decent diner is right across the street. Jim will be addressing the crowd in about fifteen minutes. It is my hope that this address will bring the crowd together, heal the wounds of the past, and that we will finally be able to set aside our differences and move forward as a unified jam. However, I fully expect the Game Maker guys and the Unity guys to continue to stare daggers at one another. Progress is Alleged; Plus, Victory! People continue to file in, and hardware and connectivity issues continue to be worked out. Today's early start was mass chaos troubleshooting, and Jim McGinley has announced victory over the Angry Network Troll. The troll has not been reached for comment. We also have good news for the out-of-towners in that building security have offered to possibly let some jammers use their chairs to sleep. No shoving allowed, epic seat scams predicted if true. Coming and going at all hours is going to be an issue, because only three people with the jam have security cards. The doors to the building are locked at 7:00 p.m., which means that we file out for dinner at 5. The official start time has come and gone. 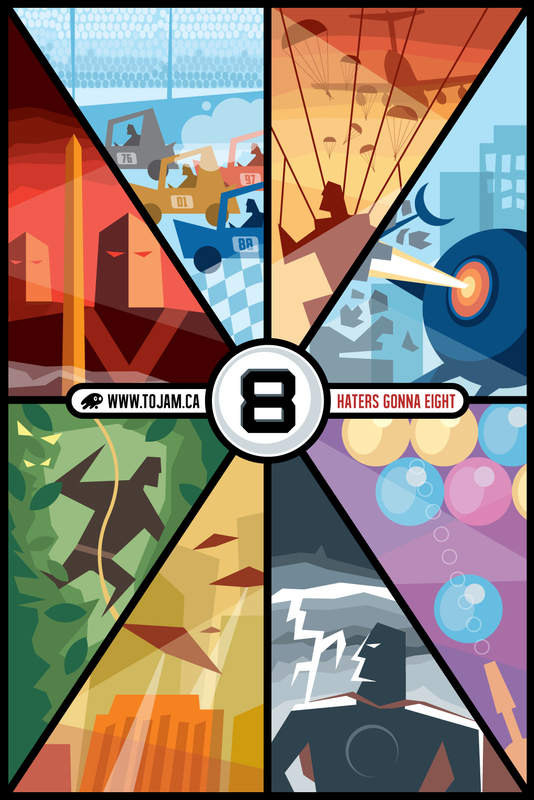 Welcome, again, to TOJam #5! 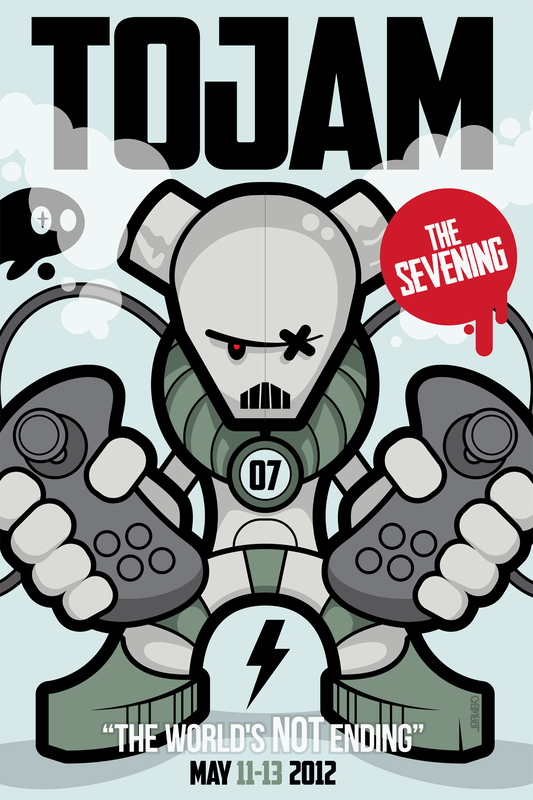 Follow the official TOJam Twitter here. For those poor souls who might actually be curious as to what I had for lunch, my personal Twitter feed is here. Welcome to TOJam #5, where the theme is missing. Jim McGinley, the co-founder of TOJam and I exchanged some vaudeville-style comedy over that already, but later I'll be sure to corner someone and get more information on the choice of theme. The game teams are filtering in during the early arrival stage. The regular arrival starts today at 3 p.m., and the event kicks off with Jim's speech at 7:45 p.m.. Right now the teams are setting up and troubleshooting. In this morning's "before you leave" email, Jim implored everyone to bring a USB key to ease file and asset sharing, but forgot to ask everyone to bring a burnt offering for the Angry Network Troll. There has been no word if the Angry Network Troll would find cheesecake tarts acceptable.